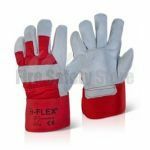 At Fire Safety Store we stock a wide range of safety gloves made from various materials to suit your needs. Our safety gloves are designed to protect you from chemicals, heat, abrasion, cuts etc. Certain material gloves will offer specific protection so make sure you check individual product pages for more information about their qualities. Our range includes long lasting gloves with elasticated cuffs for your comfort or we do packs of disposal gloves – ideal for visitors in the workplace. If you have any enquiries about our products please don’t hesitate to get in touch. We have a Freephone number: 0800 316 0890.